Moore McCormack Lines, Incor- porated, New York, N.Y., recent- ly announced three key appoint- ments of that water transporta- tion subsidiary of Moore McCor- mack Resources, Inc.
Hidalgo, manager of rates and conferences, and James E. Durick, assistant traffic manager, effec- tive December 1, 1979. York office, and was appointed assistant traffic manager. Mr.
Malagasy Republic to the U.S.
Bill of Lading and Traffic De- partments, except for two peri- ods of active duty with the U.S.
Mr. Hidalgo in his new assign- ment will continue to be respon- sible for all matters concerning rates, and represent the company in its conference memberships. Islands in the Indian Ocean. Company in the Indian Ocean. The Wareship II contains all of liner services from the east coast of South America and from South and East Africa and the islands in the Indian Ocean. B-0002) the materials, tools and supplies required to support a one- or two- well exploratory drilling program. The Ramey Tide is one of 16 new vessels completed for Tide- water Inc. last year as part of the company's fleet modernization and expansion program. It was built by Avondale Shipyards, Inc. at its New Orleans, La., facility. EMD 12-645 E7A diesel engines and has a 40-foot beam, 14-foot draft, and 125,000-gallon fuel ca- pacity. This year, Tidewater will take delivery of 15 additional vessels costing $31 million. 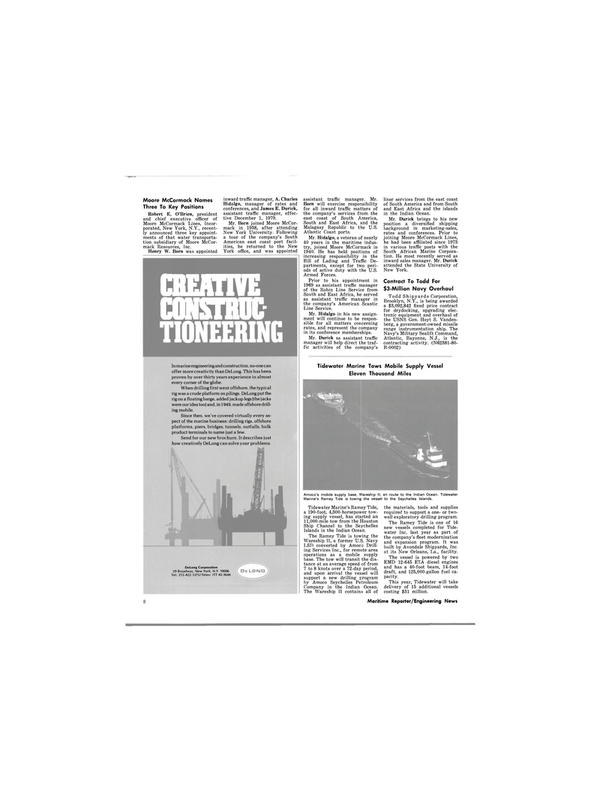 In marine engineering and construction, no-one can offer more creativity than DeLong. This has been proven by over thirty years experience in almost every corner of the globe. When drilling first went offshore, the typical rig was a crude platform on pilings. DeLong put the rig on a floating barge, added jackup legs (the jacks were our idea too) and, in 1949, made offshore drill- ing mobile. Since then, we've covered virtually every as- pect of the marine business: drilling rigs, offshore platforms, piers, bridges, tunnels, outfalls, bulk product terminals to name just a few. Send for our new brochure. It describes just how creatively DeLong can solve your problems.